More rewards for your Tuesdays! Get up to 24x GrabRewards points for your JustGrab rides on Tuesdays. Every week, on #TambahTuesday, key in the promo code MASTERCARD. Just use GrabPay with Mastercard® Credit/Debit Card as your preferred payment method to enjoy the highest possible earnings of GrabRewards points. Step 1: Launch the Grab app. Key in your Pick-up and Drop-off point. Step 2: Choose GrabPay as your preferred payment method and link your Mastercard® Credit/Debit Card. Step 3: Type ‘MASTERCARD’ in the promo code field. Step 4: Book your ride and enjoy up to 24x GrabRewards points. 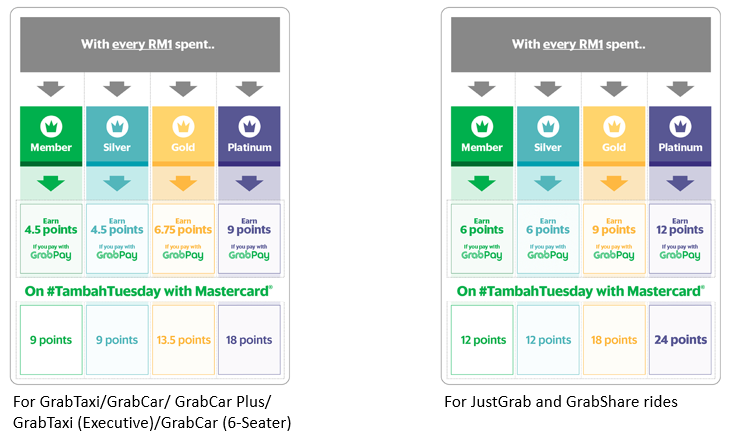 Unless otherwise specified, the campaign (“#Tambah Tuesday GrabRewards Points with MasterCard Campaign”) is open to persons (i) who are permanent residents of Malaysia (ii) who have an active email account iii) who is registered as a rider on the Grab platform in Malaysia (iii) who has taken at least one (1) successful Grab ride with campaign code “MASTERCARD” (“Promo Code”) (iv) who have activated GrabPay. Promo code is only valid to the first 18,500 Grab passengers who key in the promo code on every Tuesday. Promo code is unlimited, whereby Grab passengers can use the code as many times as possible within the campaign period. Promo code does not provide a discount off a ride – it only acts as an entry into the campaign. Points accumulated using the no-discount promo code will be credited to Grab passengers within 14 days after every Tuesday. Promo code is limited to payment with MasterCard Credit or Debit card. Promo code is valid to all Grab passengers within Malaysia where Grab services are available. Book a Grab ride via the Grab app. Type in your pick up and drop off location. Select GrabPay as the payment method. Type in MASTERCARD in the promo code field. Click Book. The code MASTERCARD does not provide a discount off a ride – it only acts as an entry into the campaign. Promotion will not be applicable for recycled mobile numbers that were previously registered with Grab. Please contact us at 1300-80-5858 if you suspect that this may be the case. The Campaign will run on 31 July – 31 October 2018. The Organiser reserves the sole and absolute right to alter or end the Campaign at any time prior to the expiry of the Campaign Period without giving any prior notice and no compensation in cash or in kind shall be given.